Everything from sneakers to coffee makers are becoming connected. In 2014, 5.6 billion connected Internet of Things (IoT) devices were reported and 30 billion are projected by 2020, according to statistics website Statista. Most devices connect through at least one RF communications protocol. 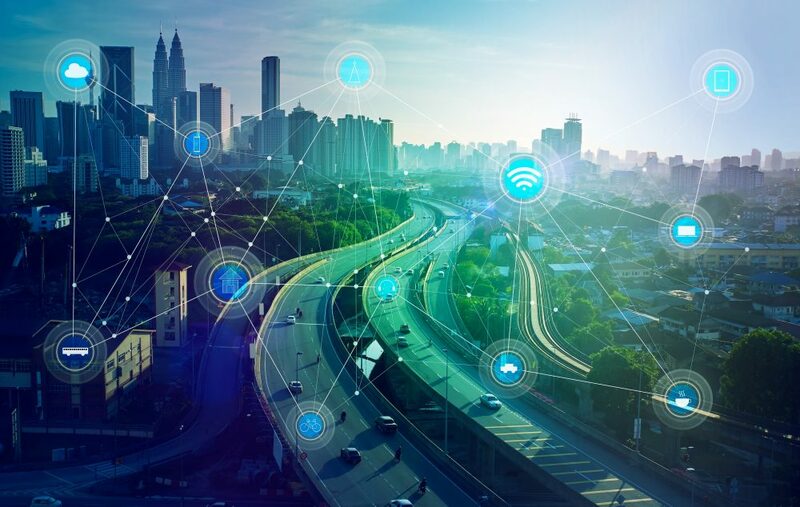 The IoT industry includes an extensive list of options when it comes to wireless connectivity. Given the broad range of applications, data rates and performance requirements such as battery size and battery life, selecting the optimal protocol or set of protocols is one of the most important early decisions in the design process for any IoT device. It’s time to check out some of the most preferred and popular choices and when to apply them in your design. NFC boasts security and eliminates the need for a battery in the linking devices. This unique protocol takes advantage of closely coupled fields to establish communication while also receiving power from the base device. The tradeoff—this method only works in extremely close range links. We’re talking about a centimeter. However, if the two communicating devices can be in contact, a secure and dedicated link is established. NFC is best used for close contact secure links like payment systems, safety monitoring and access control. An install base of hundreds of millions in mobile phones makes the protocol ideal for transferring data like graphics, contacts lists and even video to and from a phone. A complete list of NFC antennas is available here. The Bluetooth Special Interest Group (SIG) reports 4 billion Bluetooth-enabled devices shipping in 2018. Optimized for extremely long battery life through robust power conserving methods, Bluetooth and Bluetooth Low Energy (BLE) are excellent choices for devices requiring long operating life from small batteries. The long battery life comes at a cost—communications range and data rate. Bluetooth is most commonly used for computer peripherals and headphones and optimized for personal area connectivity. Since all smartphones support this protocol, it is the go-to solution for short range connectivity to a smart phone or tablet which can become the bridge to the cloud. However, do not use this protocol if you need lots of bandwidth for video or if you need to connect long distances. Wi-Fi’s expansion in range, data rate and market penetration has been impressive. Wi-Fi is ubiquitous in smart phones, laptops, tablets, set-top boxes and routers and is the go-to for wireless LAN applications. With the advent of the IoT, Wi-Fi has become the broadband wireless system of choice. Many video, surveillance, TVs, phone/conference systems and AR/VR technologies have adopted this protocol thanks to the high data rate capability and useful range. Often tethered to wall power, Wi-Fi may not always support low enough power consumption for mobile applications. A complete list of Bluetooth/Wi-Fi optimized antennas are available here. A newcomer to the RF connectivity space, Low Power, Wide Area Network protocols such as LoRaWAN emerged from the need to connect remotely-located devices that had to survive on a battery without constant manual servicing for long periods of time. Spurred by the IoT, these protocols are optimized for very low data rates. They utilize spectrum below 1GHz giving them metro-wide range and coverage despite extremely low power operation. Unlicensed bandwidth means they are low cost to operate and do not require any of the major cellular carriers. However, do not use LPWAN protocols for data intensive applications such as audio or video. The data rate cannot support that. A complete list of antennas used in sub-GHz LPWA applications are available here. The emerging cellular standard that is designed for IoT applications offers similar benefits as LPWA. Although slightly higher power consumption, NB-IoT can maintain extremely long battery life similar to an LPWA solution. The main trade off involves spectrum. NB-IoT uses licensed cellular spectrum involving the major wireless carriers that may bring slightly higher operating cost per IoT node. In return for the use of potentially higher cost licensed bandwidth, this protocol brings better range, immunity to interference and higher reliability in data and data integrity. As a system, NB-IoT is expected to provide better coverage since the major carriers already offer ubiquitous wireless support across all regions of the globe. NB-IoT bands overlap with 3G and LTE and share common antenna solutions. Access a full list here. 2G and 3G are the workhorse of the machine-to-machine (M2M) applications already deployed in vending machines, parking meters and industrial monitors using cellular modems. Ubiquitous coverage combined with relatively low cost of the established technology offer a metro-wide connectivity solution. Enabling low enough power for IoT applications, this protocol is easy to implement and is supported by a broad range of hardware module solutions and existing software. Low interference in licensed bands offer reliability and good data integrity. However, do not try sending video over this protocol. For that, you should upgrade to 4G and LTE. 4G and LTE are the latest generation of cellular technology. With 5G coming soon, these protocols remain the most popular for smart phones and IoT devices that need bandwidth. Security systems, automobiles, surveillance and data networks can count one the reliability and availability provided by the licensed spectrum. If you need a higher data rate you will have to wait, but 5G is just around the corner. Full list of antennas for 4G and LTE applications available here. Wireless applications are varied and demand an optimized approach. Each connectivity solution maximizes range and data rate while minimizing power consumption, but not every knob can be turned at once. It’s critical to select the correct protocol. It is possible to choose wisely with many protocols now emerging to address the new needs of the market. Founded in 1992, and headquartered in Austin, Texas, Abracon is a leading global manufacturer of passive and electromechanical timing, synchronization, power, connectivity and RF solutions. Abracon offers a wide selection of quartz timing crystals and oscillators, MEMS oscillators, power and RF inductors, transformers, RF antennas and wireless charging coils, Bluetooth modules, SAW filters and resonators. The company is ISO9001-2015 certified with design & application engineering resources in Texas and sales offices in Texas, California, China, Taiwan, Singapore, Scotland, India, Israel, Hungary, UK, and Germany. Abracon’s products are offered through its global distribution network.